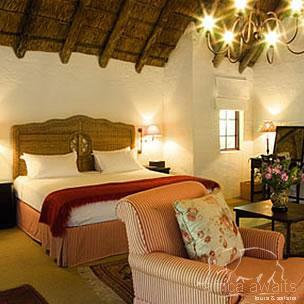 You'll find colonial luxury at Elephant House, just beyond the citrus groves in the Sundays River Valley. Feel right at home with all the family photographs, Africana art and antiques. 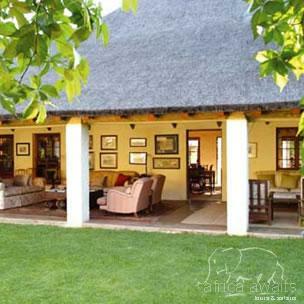 The Elephant House is an exclusive 9 bedroomed lodge situated near the Addo Elephant National Park in the fertile sun-drenched Sundays River Valley. The wide verandas (filled with comfortable sofas) forming a series of courtyards are a defining feature, while the décor at Elephant House evokes colonial & African images and is furnished with the owners' private collection of antiques, Persian rugs and Africana art. The 9 spacious bedrooms open onto courtyards & private verandas. Children are most welcome and baby sitters are available on request. Children also have full use of the “Club Room” which has games, a TV with a DVD library, and a laptop computer. After a safari, retreat back to the colonial luxury of The Elephant House – order an ice cold cocktail and take a dip in one of the two swimming pools alternatively you may simply want to find a quiet corner in the gardens or one of the courtyards to put your feet up and relax with a good book. The kitchen prepares lovely light lunches on the terrace or beside one of the pools, and in the evenings , after a sundowner, sit down to a delicious three course dinner prepared by our chefs using the very best of local produce. 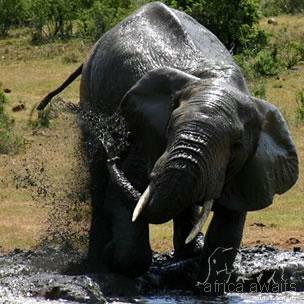 With your holiday, safari or business trip from in to Elephant House in Eastern Cape.